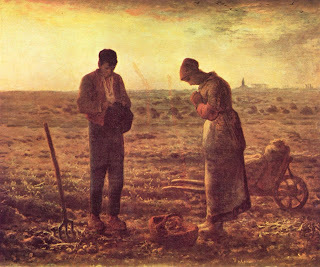 The Angelus, painted by Jean-François Millet around 1857–59, has themes much like that of his more famous painting, The Gleaners. It illustrates a farming couple in a barren field, praying over their empty baskets. Much like The Gleaners, it focuses on the harsh realities of farm life. There is speculation that there was originally a child's coffin present in the field, somewhat supported by an x-ray that shows underpainting of a geometric shape, but the evidence is inconclusive. If Millet did originally intend for this to be a funeral scene, it would only further his focus on the theme of the harsh life of the working class. The colors, much like Millet's other work, are muted and almost tranquil, contrasting the underlying theme of suffering. Though their plight is hard, their almost column-like positioning in the foreground helps them maintain a dignity and strength that Millet often emphasized in his portrayals of poor laborers.